Reason #5 why I like indoor cycling...I don't get myself into these crazy spots. I found this photo on a miscellaneous website and couldn't believe it was real until I found the original source. 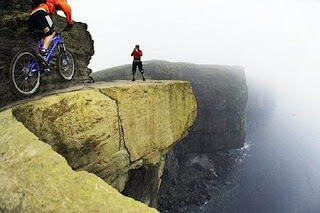 Click on the picture to see the rest of the images from this insane ride up the Cliff of Moher in Ireland. I actually get a little nauseous looking at them. And now back to my own personal brand of crazy...Spinning style! Today brings us to an interval profile, but I thought I would stir the pot and see what came out. So we start with an extended warm up, that might make you think I'm doing another endurance ride. Yeah, enjoy the flat road while you can because when we hit the 4th song we flip the world upside and take on a bunch of intervals to jack up that heart rate. But don't worry, we only do that for 3 songs and then we have a 3 song hill. This hill is going to be amazing because it only includes 3 increases in resistance and lasts just over 12 minutes. Don't worry, even with only 3 increases you'll get your sweat on. At the end of our hill, we bring our SexyBack with some jumps. Brace yourself! Class Builder™ by Cycling Fusion is simply the best indoor cycling app I've found. This app let's you design, document and then ride each of your profiles. Designed for the fitness professional, this app handles both Pre- and Post- class music as well as a slide show (if interfaced with a monitor or projector).